I would fight tooth and nail to get anything — and I mean anything — to save [his own child]. I’d do it even if it cost a fortune and might not work. That’s why I don’t think you should leave these kinds of decisions up to the individual. Every single person feels the way I do about every single person they love, and no one will ever be able to say no. That’s human. So whose job is it? Well, mine for instance. That’s what I do as a health services researcher. That’s what policy makers should also do…. That’s a roundabout way of saying that only the government can ration care the right way. Here is Don Taylor’s (Incidental Economist) take on the subject. My view: people in health care have become so completely immersed in the idea of third-party payment that they have completely lost sight of the whole idea of agency. Can you imagine a lawyer discussing the prospects of launching a lawsuit without bringing up the matter of cost? What about an architect submitting plans for a building but completely ignoring what it would cost to build it? Outside of medicine, can you imagine any professional anywhere discussing any project with a client and pretending that money doesn’t matter? Of course not. Then what is so special about medicine? Answer: the field has been completely corrupted by the idea that (a) patients should never be in a position to choose between health benefits and monetary cost, (b) doctors shouldn’t have to think about such tradeoffs either, (c) in order to insulate the patient from having to choose between health care and other uses of money, third-party payers should pay all the medical bills and (d) since no one else is going to think about what anything costs, the third-party payer is the only entity left to decide which services are worthwhile and which ones aren’t. To appreciate how doctors could do the same thing other professionals do in advising patients on how to spend their own money, take a look at the graphic below. These numbers are several years old and there may be more recent studies, but the graphic will serve our heuristic purpose. Armed with this information, what would a responsible doctor tell her patient about Pap smears and how often the patient should get them? Source: Tammy O. Tengs et al., “Five Hundred Lifesaving Interventions and Their Cost-Effectiveness,” Risk Analysis, June 1995. Notice what is going on here. The responsible doctor, functioning as an agent of a patient who is not familiar with the medical literature and who is not skilled at evaluating risks or trading off risk reduction for other uses of money, advises her patient in these matters. She helps her patient manage both her health and her money — because both are important. When Dr. Carroll says “I’d do it even if it cost a fortune and might not work,” I am sure he is being sincere. But I am equally sure that is not how he normally makes decisions. It is in fact easy to spend a fortune to avoid small-probability events. The EPA makes the private sector do it every day. But if an ordinary family tried that, they would end up spending their entire income avoiding trivial risks. And that is not what normal people do. 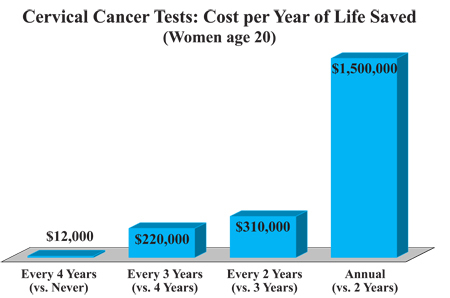 Emanuel claims there is no evidence the treatment works for prostate cancer — so the therapy is a waste of $25,000. Is he right? I don’t know. If you’re paying the extra $25,000 out of your own pocket, listen to what the doctors at Mayo have to say (in favor of its use) and then listen to what Emanuel has to say and make your own mind. Bottom line: helping patients manage their health dollars as well as their health care should be what doctoring is all about.